Silviniaco Conti, trained by Paul Nicholls, made all under Ruby Walsh to win the Betfair Chase in terrific style from the 2011 Cheltenham Gold Cup winner Long Run, passing the post at Haydock Park two and a half lengths to the good. 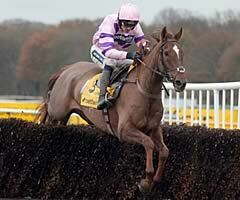 Nicholls said of Silviniaco Conti: "He is a really decent horse. He's only six, he jumps and he stays. We had a chat before and to Ruby I said that if they go quick, get a lead but, if they don't, just bowl along in front because he jumps and gallops. There's no better man to ride him in front than Ruby. 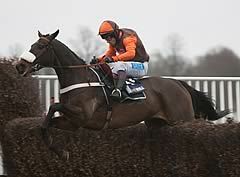 "I am not going to rush him and I might go straight to the Gold Cup (Cheltenham on March 15, 2013) with him. He loves to be fresh and I am not going to run him all winter in the mud - he's only a baby and he could be really interesting come Cheltenham. "I thought that he didn't get the credit he deserved at Wetherby. He is a second-season chaser - he jumped, he travelled and he won really well. "You have got to see him do it on the track. Long Run is a very, very good horse but it was a great performance for a six-year-old. "He won't go to Kempton (for the King George)." Walsh commented: "The Gold Cup looks the natural step for him. He is a good stayer - he is not slow - and it's great to have another chance of riding a Gold Cup winner. "We discussed it a fortnight ago with the owners and we decided to come here. We were all of the same opinion that the King George this year would be more of a speed race with all of the two milers and two and a half milers. "We will be happy enough if we win in March." Long Run, the 11/8 favourite, struggled with his jumping on the first circuit and once again occupied the runner-up berth - the same position he filled in the race 12 months ago. Jockey Sam Waley-Cohen said: "He's run his race but we've been beaten fair and square. The ground was a bit soft for him but it was the same for all the others and we've got no excuses. Hopefully this will put him spot on for the King George and that's where he'll head next." David Bridgwater who trains the Gold Cup runner-up, The Giant Bolster, said: "He's bound to come on for that, they all will - apart from the winner. We've got a lot of improvement. The winner is a good horse but the winner is very fit and has had the run of the race. "It was a bloody good run by our horse. The class horse of the race is the second horse (Long Run). The winner has won because he is fit and we have finished not far behind - and Mr Henderson (Long Run's trainer) has got better gallops than I have! "There's the King George at Kempton and the Lexus at Leopardstown in Ireland so we will see what happens." Ruby Walsh, the winning rider on Silviniaco Conti, said: "There is a great crowd here at Haydock and we have seen it before with Kauto Star. They come out and support racing and it is great that they got a good performance from Silviniaco. 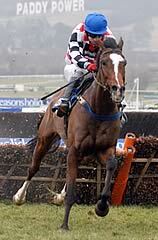 "I guess I assumed The Giant Bolster might make the running but probably you should never make assumptions should you? When the tapes went up and no one wanted to go on, Paul (Nicholls) did not mind me going on and so I went on. "I dictated things the way I wanted to and he jumped really well and he travelled really well. I guess when you are in front, you are in control of the race. "I was always happy I was doing things I wanted to be done. It would easier to have wing mirrors but I wanted to see what was going on (when he looked around). It was nice when it comes off but obviously when you make the running you can be a sitting duck as well. It is a fine line and great when it does work out. "I would be delighted with that - it was a good performance. Paul has trained four Gold Cup winners so whatever he thinks I am happy to go along with. "This horse has always been a very good jumper, from the first day (over fences) he ran at Chepstow and Cue Card beat him. He likes jumping - he takes you to the fence. It is a big help when they do that. The horses are going the right way. "I guess you were wondering which Long Run was going to be here today. The Long Run who won the Gold Cup would be nearly impossible to beat but the Long Run who came third last year (in the Gold Cup) we would have a chance of beating. That's the chance you are taking but if you are going to take the next step up this is the kind of performance you have to be putting in. It is great he did. "We were delighted with him at Aintree (when he won his final start of last season) but people were knocking the form and saying the other horses were over the top. "He was showing the right signs when he came in for this season. When Paul Nicholls rings you in the middle of September and says you want to see this that gets you going. "Al Ferof and Silviniaco Conti have big boots to fill but they are going the right way. The horses are in great form and every weekend there seems to be a big winner. It makes for short weeks!" Paul Nicholls declared: "He ran in France as a four-year-old (questioned about having enough experience) and it is more about having the ability and being good enough at the right time of their life. If he is fit and healthy you go. Kauto did when he was six and this horse jumps better than Kauto. "This horse is a really sound jumper and he can only improve, He hasn't been to Cheltenham before but I never worry about that too much. He has been around Haydock, he has been around Wetherby, he went around Aintree and he is fine. "I thought if he won today then he will definitely go to the Gold Cup. If we run before is an issue but I would not be worried if he did not run before. I certainly won't run him over Christmas. He is not a great horse in the middle of the winter and if we leave him now and then just tick him over and try and get him at his very best for Cheltenham. "It is very exciting. The young horses have been amazing this year - we have lost the older lads who have retired. It is a dream come true to have the young horses come through. I am thrilled for everybody. Good horses are versatile and can win on any ground."